Bring life and color to your landscaping by drawing in local birds to your back and front yards. Your family will have hours of enjoyment watching them and they provide a tranquil setting for relaxation and pondering world events. Everything for your feathered friends! This is the place for the "dedicated bird watcher" or "casual admirer". 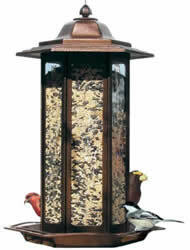 Find bird houses, feeders, bird seed, bird baths, and much more. In addition to birds you can care for Bats, Butterflies, Lady Bugs, Squirrels and even Toads.